Putin Endorses McCain–Well, sort of! Just as Obama’s glow from his “endorsement” by Nuri al-Maliki had begun to fade, along comes Putin to remind voters what a dangerous place the world really is–and that putting a very junior Senator at the helm would be insanity. McCain’s proposal from a few months ago to boot Russia from the G-8 has gone from seeming needlessly provocative to practically prescient. Together with the surge in Iraq, the Georgian crisis is the second strategic matter on which everyone else has followed the senator’s lead. McCain warned of Russian designs on its “near-abroad” when Boris Yeltsin was still in power, and advocated the enlargement of NATO into Eastern Europe — as a way to cement those countries into the West and check Russian adventurism — years before the Clinton administration adopted it as policy. McCain’s judgment benefits from years of marinating in national-security issues and traveling and getting to know the key players; from a hatred of tinpot dictators and bloody thugs that guides his moral compass; and from a flinty realism (verging at times on fatalism) that is resistant to illusions about personalities, or the inevitable direction of History, or the nature of the world. Here’s a link to an earlier post which illustrates McCain’s prescience on Russia (Youtube video embed’s from 1999 & 2000). McCain got it right on Russia and Putin as far back as 1999. Watch these two videos and see if you don’t agree. HT: Jonathan Martin at Politico! Per The Independent UK—Russian President Dmitry Medvedev said earlier today that he had ordered an end to military operations in Georgia. But Georgian Prime Minister Lado Gurgenidze told Reuters that Russian jets were still targeting civilians. 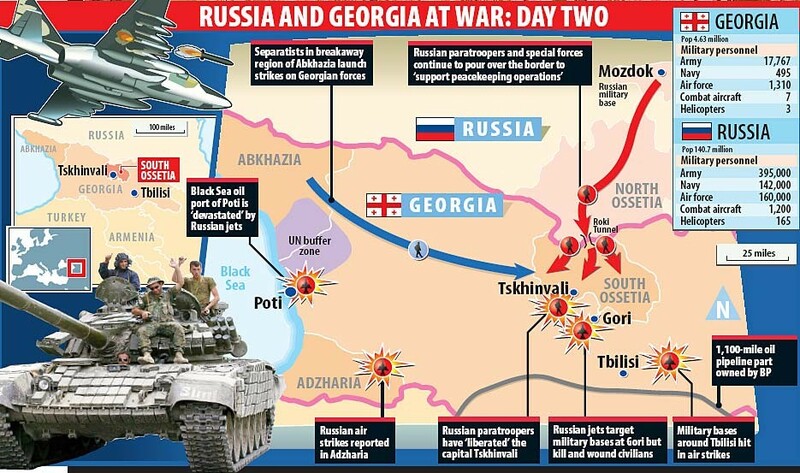 A column of Russian forces was also seeking Sunday night to enter Georgian territory from Abkhazia, another separatist enclave to the west, and Abkhaz fighters were massed at the boundary line, an Abkhaz official said in an interview. 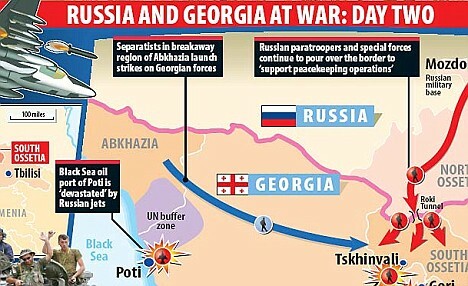 The advance appeared to answer the question on which the conflict had been pivoting: Would Russia simply occupy the two separatist territories of Abkhazia and South Ossetia, or would it push into Georgia, raising the possibility of a full-scale invasion? Gori, about a 45-minute drive south from the capital of South Ossetia, Tskinvali, sits in a valley that is the main route connecting the east and west halves of Georgia. In Washington, American officials reacted with deepening alarm to Russia’s military activities on Sunday. Georgian troops had tried to disengage, but the Russians had not allowed them. Additionally, it was reported that last night that Russia was bombing the Tbilisi International Airport and today is bombing a military airport at Tbilisi. Read the article at Daily Mail Online UK.